English navigator and third circumnavigator of the globe after Ferdinand Magellan [1519-22] and fellow English navigator, Sir Francis Drake [1577-79]. Born at Trimley St.Martin, Suffolk 1560, commanded one of the ships in the flotilla of Sir Richard Greville sent by Walter Raleigh to establish the first English colonial settlement at Roanoke in Virginia in 1585. In July 1586, he sailed from Plymouth on the second English circumnavigation of the globe, sailing from West Africa to Patagonia. Here he discovered a large harbour in the Straits of Magellan which he named Port Desire, a manuscript chart of which is still extant. He sailed through the Straits of Magellan & up the west coast of South America ravaging Spanish settlements before proceeding via the East Indies, Philippines & Cape of Good Hope to reach England in early September 1588, just after the defeat of the Spanish Armada & after more than two years at sea. A second circumnavigation was planned in 1591 but ended in disaster when his fleet of five ships was dispersed in storms and he died at sea in the north Atlantic in May 1592. 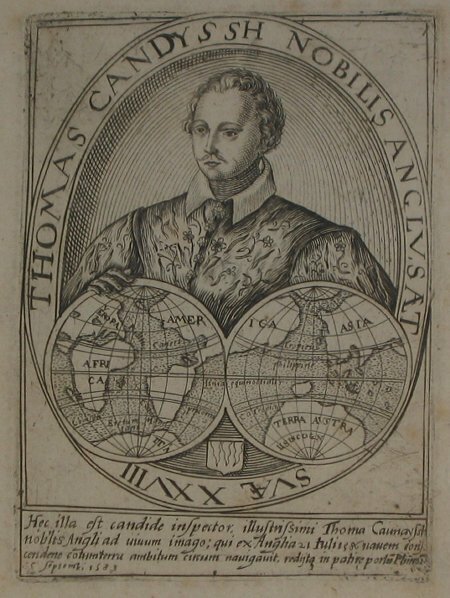 Cavendish was related by marriage to the famous English cartographer & Italian exile, Sir Robert Dudley [1573-1649] famous for his maritime Atlas L'Arcano del Mare (Secrets of the Seas) first published in Florence in 1646.